Which Is More Valuable: Gold, Cocaine or Rhino Horn? The answer is devastating news for Earth’s largest animals. Many of the world’s largest herbivores — including several species of elephants, rhinoceroses, hippopotamuses and gorillas — are in danger of becoming extinct. And if current trends continue, the loss of these animals would have drastic implications not only for the species themselves, but also for other animals and the environments and ecosystems in which they live. One of the critical factors behind the disturbing trend is the tremendous financial incentive for poachers to sell animal parts for consumer goods and food. For example, rhinoceros horn is more valuable by weight than gold, diamonds or cocaine. A recent report puts the price of rhino horn in Asia at $60,000 per pound. Rhinos are in serious danger of extinction from poaching. Rhino poaching has risen to levels not seen in almost two decades. 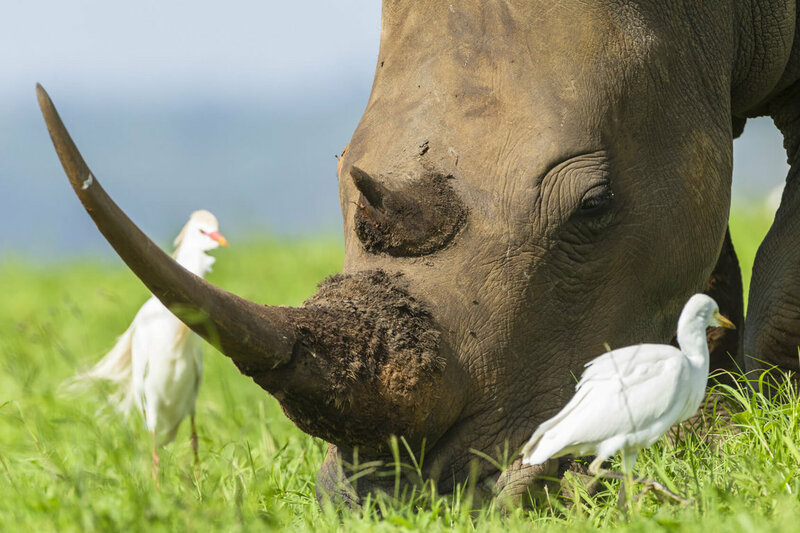 Although there is no scientific proof of its medical value, rhino horn remains highly prized in traditional Asian medicine, where it is ground into a fine powder as treatment for a variety of illnesses such as nosebleeds and fevers. This demand has created highly profitable international criminal syndicates who have only intensified their search of rhino for their horns in recent years. Decades of conservation efforts are being reversed by the entrance of organized crime into the ivory and rhino horn markets. In just 9 years, the number of forest elephants declined by 62 percent. More than 100,000 elephants — one-fifth of the world’s wild savannah elephant population — were poached in 2 years alone. The number of rhinoceroses poached skyrocketed from 13 per year to 1,004 per year in only 6 years. Latest estimates suggest that two rhinos are killed by poachers every day in Africa. If rhino poaching is not stopped, the world could lose African rhinos forever. For some of the largest animals, such as elephants and rhinos, it is likely a matter of a few decades before they are extinct — and no more than 80 to 100 years for the rest of the large herbivores. Even though an individual elephant or rhino might persist in the wild somewhere in Africa, they will be functionally extinct in terms of their impact on the ecosystem. Without radical intervention, large herbivores (and many smaller ones) will continue to disappear from numerous regions with enormous ecological, social, and economic costs. During the Pleistocene Epoch, which ended about 11,700 years ago, there were more than 40 species of herbivores in which adults weighed 2,200 pounds or more, but today there are only eight such species. The extinction of these “mega-herbivore” species has dramatically affected Earth’s ecosystems. For example, large herbivores are the primary source of food for predators and scavengers, and their trampling and consumption of plants influence the ways that vegetation grows. The two largest threats to these animals are hunting by humans and habitat change. Other key factors include growing human populations and increased competition with livestock. Animal agriculture has been a particular threat in developing nations, where livestock production is dramatically increasing. Animal agriculture is the leading cause of species extinction, habitat destruction and wildlife culling. Large herbivores, and their associated ecological functions and services, have already mostly been lost from much of the developed world, according to scientists. Now is the time to act boldly, because without radical changes in these trends, the extinctions that eliminated most of the world’s largest herbivores 10,000 to 50,000 years ago will only have been postponed for these last few remaining giants.